Plain Language Summary: Typhoon Nepartak was a category 5 tropical cyclone of 2016 and had significant societal impacts. It went through a rapid intensification (RI), with an increase of maximum wind speed of 51 m s−1 and a decrease of minimum sea level pressure of 74 hPa in 42 h. The real-time forecast from the Coupled Ocean/Atmosphere Mesoscale Prediction System – Tropical Cyclone (COAMPS-TC), starting from 1200 UTC 3 July, predicted the track and intensity reasonably well for Super Typhoon Nepartak and captured the storm’s RI process. Positive interactions among primary and secondary circulations, surface enthalpy fluxes, and mid-level convective heating are demonstrated to be critical for the RI. 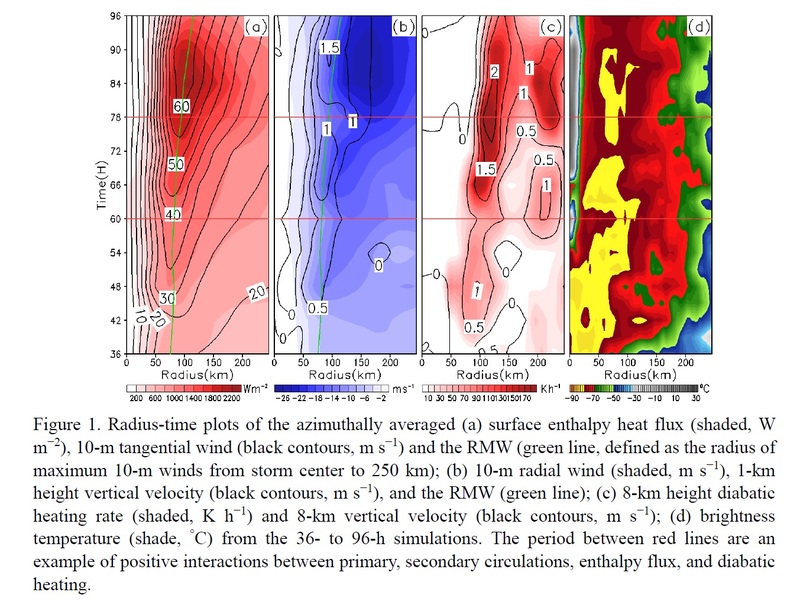 The storm structure variations seen from the simulated satellite infrared brightness temperature during RI bear considerable resemblance to the Himawari-8 satellite images, although the forecast inner core is too broad, presumably due to the relatively coarse resolution (5 km) used for the real-time forecasts at the time.